Boarders have to maintain their rooms neat and tidy, make their beds and keep the soiled linen in the baskets/bags provided. No boarder will be permitted to remain in the hostel during class hours without the express permission of the Warden/ Principal. Secure and peaceful residential environment. Protection, care and tolerance from others. Freedom from harassment, bullying and victimization from others. Sporting, Physical and outdoor opportunities. Communication with parents, relatives and friends. Help maintain a secure and peaceful residential environment. Respect themselves, the school and others. Be sensitive to the beliefs and customers of others. Participate in social, sporting, outdoor and cultural opportunities to the best of their ability. Be safe and aware of boundaries, rules and regulations at all times. Contribute to community life in as many ways as possible. Parents are expected to co-operate with the school authorities in enforcing punctuality, regularity and discipline. Please ensure that your ward revises the lessons and does the homework regularly. 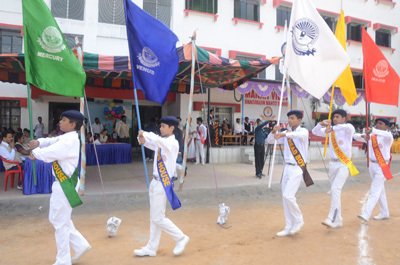 Parents should take an active and helpful interest in the activities of the school. As the medium of instruction in the school is English, it would be helpful if the student can practice English conversation at home. Parents may, therefore, encourage the students to converse in English. Awareness of current affairs through discussions at home goes a long way to build a sound base for good general knowledge and ability to participate in discussions elsewhere. Students should be encouraged to read newspapers, books and magazines. Students suffering from contagious or infectionus diseases should not be sent to the school unless cured completely. Parents/Guardians are requested to go through the school diaries of their wards every day. Remarks made in the diary should be seen and countersigned by the next day. Parents are requested to intimate the school office promptly in the event of any change of address or telephone number, so that the school authorities can contact them quickly in case of emergencies.